Oliver Jones is young man unafraid to take the difficult path. 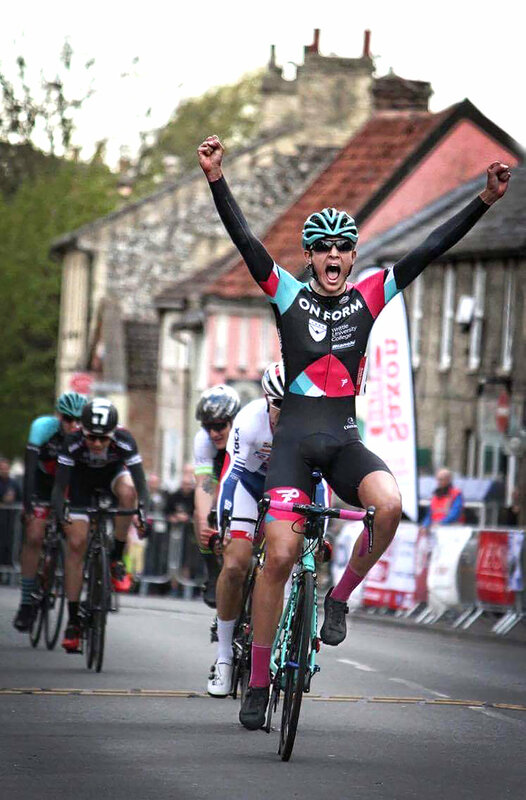 In an era of junior teams with liveried support cars, and multiple avenues for the new young guns of British cycle sport to explore on a journey they hope will lead to the professional ranks, Jones has chosen the traditional route. France beckons. "It's going to be hard, but it either makes you or breaks you, at the end of the day. If I come back at the end of the year, and I come home crying to my dad - 'It's too hard, I can't do it!' - then I'll move on to some other part of my life, but if that's what it takes, then that's the way to learn." Judged by any standard, Jones is level-headed. His appetite for hard work is even more admirable, given that he could he return in a moment, should he choose, to the catwalks of London or Paris, where he has previously walked out for Burberry. Indeed, Simpson's Soho shoot is interrupted by a fashion insider proffering his card. Photographer Sean Hardy is taken aback, but Jones is blasé. It is not the first time in his young life that fashionistas have attempted to secure his services as the face of their collections. Less determined characters might see an easy option, however strong their passion for the bike. Jones is different - a young man very definitely on a mission. He is a rider for whom racing is essential to the fulfilment of his desire, and no child of the MAMIL revolution, even if cycling entered his life as a passion to share with his father. Competition is vital to his enjoyment of the sport, and the attainment of the myriad small details that separate a professional cyclist from even the most dedicated amateur. Despite his looks and talent, Jones - Ollie to his friends and Ollie Jones Mod to those who follow him on social media - is not given to self-regard. During our conversation on a Skype connection from Calpe, he refers frequently to the support he has received from his parents, the friends-turned-backers who have helped to fund his all-or-nothing trip to France, and to Clive Tricker of the Ipswich Bicycle Club. By the time you read this, Ollie Jones will be in France; in Limoux, more specifically, close to Carcassonne, in the southern region of Occitanie. He made contact with the Culture Velo team, backed by a national chain of bricks and mortar bike shops, through his coach Mark Walker. Jones had ridden with Simon Carr, another of Walker's clients, in last year's Tour de Martinique, and subsequently made a connection with Culture Velo. It was not the first French team he'd approached. An opportunity to join a different squad fell through when the team manager resigned at a moment when Jones had been close to booking his flights. The rider admits to "a few tense weeks" before the Culture Velo contract was finalised, but used the time wisely, learning French and gaining financial support from various quarters. "I approached a few people, some good friends, and said: 'Look, this is what's going to happen, do you think you can help out?' And everyone has just been massively generous. I can't thank them enough for what I can do now, because of them." None of this has been easy, however. When describing the last, critical phase in securing his French placement, the words apprehensive and stressful fall from Jones' lips, albeit in a laconic and self-deprecating tone which suggests that stress and apprehension are not states with which he is routinely acquainted. One thing is certain: he is absolutely committed to a pathway that British Cycling's vaunted 'medal factory' had seemingly made obsolete. Owain Doull's presence in the Bradley Wiggins-led men's team pursuit squad for the 2016 Olympic Games in Rio might have proved that Manchester is still the destination of choice for the aspirant pro (Doull, after all, now rides for Team Sky), but nothing about the process appeals to Jones. Jones' love affair with cycling began in 2012, a year in which the sport's popularity reached its zenith in England, and when he was still only in his early teens. With Wiggins victorious at the Tour de France and Mark Cavendish enjoying a year in the rainbow stripes, Jones is unlikely to have been the sport's only young convert, but how many would have had the talent and dedication required to pursue their passion to the same extent? Cycling has helped to form a close bond between Jones and his father. The pair first became acquainted with the sport when the Tour Series came to Ipswich. There they met Clive Tricker, attempting to drum up support for the Ipswich Bicycle Club. Tricker invited father and son to come a club ride. The rest, as they say, is history. "I think the next weekend me and my dad went to a bike shop and ended up buying the cheapest bikes we could find, and the weekend after that, went out on the club ride, and came back thinking it was the best thing we had ever done. And it's sort of escalated from there. "My dad always says I had the biggest grin he'd ever seen on my face, after that first ride, and we cleaned the cupboards of food. That was me out cold for the afternoon. And it's gone from that to riding weekly, and somehow this has happened, and I'm moving to France, and cycling is my life now." Jones rode a cyclo-cross season, competing in the youth category on a bike borrowed from Tricker. He says he was "roped in" to trying the discipline, one that forms a significant part of the Ipswich Bicycle Club calendar, and while he admits to having "a whale of a time", 'cross could not replace the road in his heart. "Road racing is proper racing. That's the sort of thing that I want to be able to do, and especially stage races; that's just proper bike racing, at the end of the day. There's no hiding or messing around, when you're racing for ten days. It's full on. Everything is important, and not just on the bike. Everything you do is about getting everything out on the bike, and that's what fascinates me." There are many refreshing aspects to Jones' outlook, but his willingness to learn and to admit the gaps in his knowledge separate him from some of similar age who believe they know all there is to know about cycling, or at least all they need to know. Watch a young rider at a training camp, and the scale of the challenge he faces in picking up the myriad small tricks of the trade quickly becomes apparent. Even something as fundamental as holding onto a moving team car is a skill to be mastered. There are a hundred more examples, from the essentials of removing a rain jacket and fetching bottles, to the advanced positioning skills demanded by the lead out or the team time-trial. Jones is keenly aware that his education is ongoing, and likely to accelerate. "You're always learning, and there are so many hints and tips, even if it's just moving around the bunch, which is a massive one. I've been racing for three or four years now, and I would say I'm still nowhere near the top guys," he admits. "I raced in the national championships last year, and watched the WorldTour guys. They can just pick their way through a bunch of 200 people; just effortlessly glide through gaps that aren't there, and all of a sudden, they're at the front, and you wonder how the heck they've done that." He can expect many hard lessons in France, a tough school whose successful British graduates include Sean Yates, John Herety, Charlie Wegelius, and, most recently, Adam Yates. Such luminaries are rare, however. Those who fall by the wayside are more plentiful, and, by the nature of failure, unknown. Still, Jones is undaunted. "You've got to chuck yourself in and see what happens. If that's what it takes, then that's the way to learn. That's bike racing, at the end of the day. I do all the training. I do everything right. I put in good fuel. You've just got to learn your craft, and hopefully the results will come." At first glance, the hard graft of bike racing is a world removed from the seemingly pampered existence of a fashion model, but perhaps there are similarities. Anyone who has spent time inside professional cycling knows that the gleam of the bikes and buses is merely a surface sheen. Is the same true of high fashion? Jones might be uniquely placed to answer. He recalls a shopping expedition with his parents to the cavernous Westfield mall, interrupted by "some guy" thrusting a business card in his direction. Fortunately for Jones, his mother had been a fashion model, and, after some research online was able to establish the photographer's credentials with one of London's biggest agencies. The following morning, he woke up to three emails from the persistent snapper, asking for portfolio pictures. The approach opened a year-long chapter in Jones' life, in which he combined schoolwork with modelling. Typically, he is matter-of-fact about the experience. "I thought: 'This is quite weird, and not me at all.' But then I thought: 'If it can get me out of school for a day, then I'll do it, and see what happens.' I ended up sending some pictures, and then travelling up and down to London for probably the best part of a year, doing all sorts of castings and photoshoots." Jones found himself on a road that led, ultimately, to the catwalks of London and Paris, and a starring role with Burberry. He reflects positively on the experience, even if it was not one that could replace his need to ride a bike and to race. Still, it is evidence that Jones is a man who rides from love of the sport, rather than necessity. "It was quite interesting, but never really something that I sort of looked to do, or realised was a job, but it made up a year of my life. I moved away from it to commit to the cycling fully, but it's nice to look back and to have some nice pictures, I guess. I can't really complain." Jones is clear that modelling appears more glamorous than it is. He recalls working 16 and 17-hour days at London and Paris fashion weeks, "running backwards and forwards around the city", and getting up the following morning and doing the same thing again, for seven days. He is not complaining. The life of a fashion model is, he explains, "a weird experience, but enjoyable." The running around town is the easy bit, one suspects. Finding the poise and composure to stride down a runway alone, and in front of the world's media, is perhaps where the 'work' begins. There is no peloton to shelter in; no team-mates to whom he might turn. Jones insists that his mother, chaperoning her then 16-year-old son, was more awed by proceedings ("uncontrollably excited"). His own realisation that representing a global fashion brand might bring its own pressures came when he stepped onto the catwalk. "It was pretty crazy. You're stood there waiting and then, all of a sudden, off you go. You think: 'All I've got to do is walk in a straight line' but you're thinking about everything. I looked down and saw Samuel L Jackson stood there and thought: 'Oh my goodness - Darth Vader is here'. "You come back and think: 'I've just walked in front of all these people, wearing clothing that's probably priced ridiculously' but it's a part of a crazy experience. It's something that no one can ever take away. I'll always have done that. That's pretty cool." 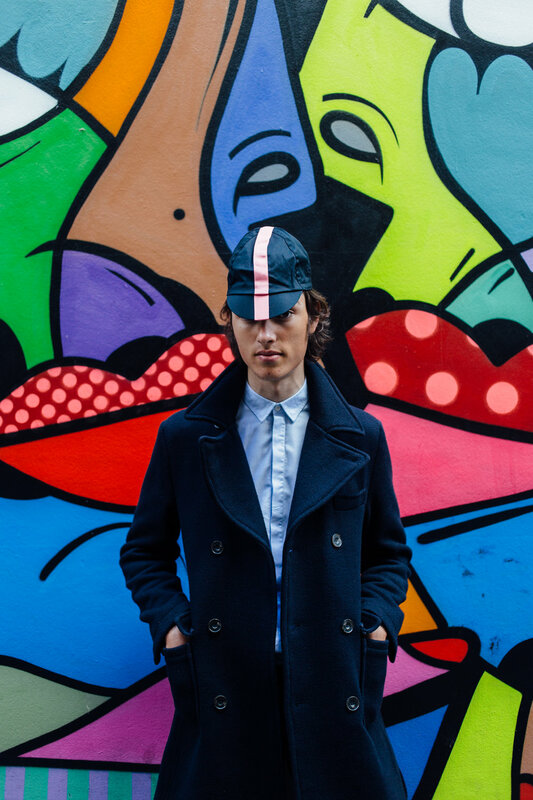 While he is young, fashion will offer an alternative career path, but Jones has no interest beyond cycling. The races of the Coupe de France will offer little in the way of glamour, even if the Tour of Guadalupe should at least provide better weather. Jones will ride in all of these races for CSCA Propreté 2000. For many, the life of a catwalk model represents a dream career and it is to Jones' credit that he regards it as a sideline. The images that illustrate this article prove how easily he might make a living from posing for pictures, but he is determined to test himself in more demanding environments than London's West End. Jones is a young man on the rise, if not one in a hurry. He is keenly aware that he must learn every aspect of the professional cyclist's trade, if he is to accede to its highest ranks. There are no short cuts on a road he hopes will lead to the UCI WorldTour and a position in the peloton. The road to France is well travelled by young British riders seeking to make a name for themselves, but in the modern era it is a pathway sought only by those with real dedication. The comparative security of a place within British Cycling's vaunted Olympic Academy, or with any of Britain's six UCI Continental squads is more appealing to most. Jones is cut from a different cloth. His early promise has already been recognised, both by Team Onform, a development squad, and by the Pedal Potential fund, but he must successfully negotiate the sporting chasm that separates the French second division and even the biggest races of the UK domestic calendar from professional cycling's top tier. His willingness to try speaks volumes for his character. "There are a hundred and one guys who are my age and want to race bikes, but it all comes down to who's got it at the end of the day," he says. "I don't know what they are doing, but I know that I'm doing everything I can to be the best I can." Jones' time in France will almost certainly accelerate his education. A strong time-trialist, he will work in the short term on transferring that power to climbs; a transfer of skills mastered by Wiggins, his idol. Nor will he lose sight of the small details that make a professional cyclist. "Fingers crossed, with my working with my coach, and all the support the team is giving me, cycling will become my job, properly," Jones says. The laconic tone in which he described his days as a fashion model is now absent. He is serious. Jones is a young man to whom bike racing matters, intently. At Simpson, we wish him every success.